Eli Kowalski was born in Israel and immigrated to the US at the young age of six. He is an award-winning children’s author from Philadelphia, Pennsylvania. Eli has traveled to over 325 schools in the Mid-Atlantic region where he regularly engages with young students and encourages them to write and explore their creative talents. He is the author of 14 published books and has developed a number of successful toy products over the past three decades. 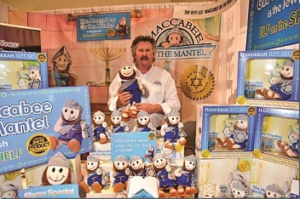 His latest book Maccabee’s Hanukkah Story is the winner of the Creative Child Magazine’s “2016 Book of The Year Award” in the category of Holiday Books with Plush Toys for Kids. Maccabee’s Hanukkah Story, was written as an easy-to-read, detailed storybook that teaches the true story of Judah Maccabee, who rallied his family and friends to miraculously defeat the Syrians and regain the destroyed Temple in ancient Jerusalem. The book and the “Hanukkah in a Box” concept was to bring out the true meaning, inspiration and fun of this holiday.